Throughout history, jewellery pieces have been remodelled and updated to reflect current designs. As a result, few jewels of bygone eras remain in their original condition. There is renewed interest in those rare pieces that remain untouched, and whenever they appear at auction, they are avidly pursued for their design and historical importance. Fashions of the 19th century ranged from austere neoclassicism to zestful, mid-century naturalism and revivalist trends. 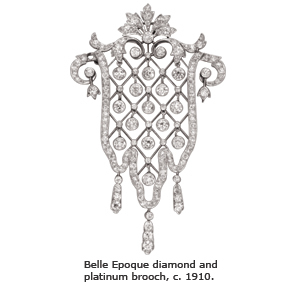 Designs became more delicate and refined toward the end of the century. Diamonds were cushion-shaped to closely follow the outline of the rough. Silver was used in settings to maximize whiteness and glitter under candlelight. 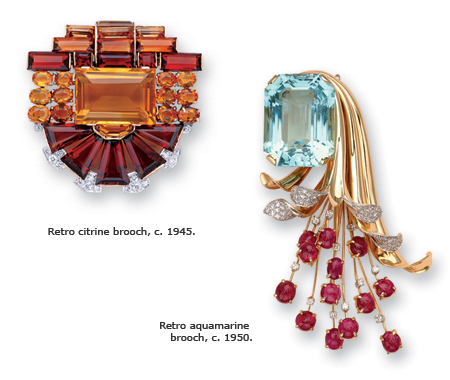 Colored gems began to appear in fine pieces, including velvety Kashmir sapphires, Burmese rubies, grass-green demantoid garnets from the Ural mountains in Russia and black opals from Australia. 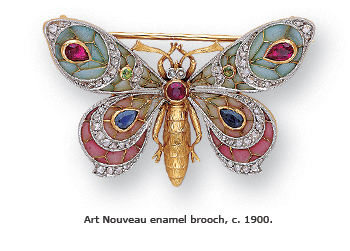 Jewels from this era are treasured for their design and craftsmanship rather than for their intrinsic value. This style followed new and original design principles, and made use of innovative materials and enamel techniques. Representations of the natural world flowed in sinuous curves and asymmetry. Designs featured dreamy lilies and lotus blossoms, serpents, swans and the female figure. The free-flowing forms were a deliberate reaction to the mass-produced, machine-made jewellery of previous decades. With the discovery of a reliable source of platinum, new and exciting possibilities were available to jewellers. Platinum quickly replaced silver for setting diamonds due to its malleability, strength and absence of tarnish. Coincidentally, the demand for diamond-set jewels increased with the advent of electric lights, which encouraged more frequent social evenings. Improvements in diamond cutting technology allowed for diamonds of all sizes to be cut perfectly round, and this greatly simplified the procedure for setting. This light-heartedness inspired lavish, yet delicate jewels. Motifs included flowers, trailing leaves, bowknots and ribbons with a lace-like openness that came to be known as the garland style. Necklaces and ear pendants were the most popular accessories worn at the grand balls. Other fashion statements included delicate chokers cornbined with elaborate pendants, multiple strands of natural pearls, lavalieres and negligee pendants (with two drops of unequal length). Bold, simplistic stylization was the hallmark of the Art Deco period. Sautoil and pendant earrings swung to the new rhythm. Bare arms became more common, and these needed to be adorned with bracelets. A major innovation of this period was the wristwatch, which made the ubiquitous pocketwatch a thing of the past. 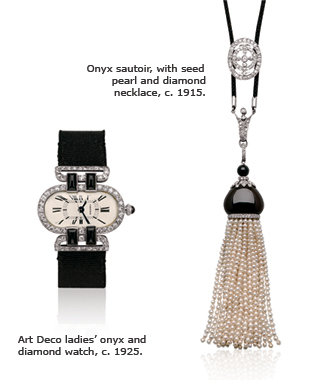 Wristwatches for men were square or rectangular, while ladies’ watches had smaller dials with cases and bracelets covered in diamonds. Cigarette cases and powder compacts were considered so-called necessaires de soirs and these were often decorated with inlaid hardstone, diamonds or enamel on lacquer. Another technical innovation was the invisible setting, which allowed rubies and sapphires to be closely set without the use of prongs. Abstract geometric compositions often emphasized con- trasting color combinations of gemstones that were carved to fit the desired form. Motifs became almost architectural in form, with white expanses of diamonds highlighted by rubies or sapphires. By the mid 1930s, sleek geometry gradually softened into more sculptural, three-dimensional shapes, signaling the return of feminine curves. During wartime, austerity curbed the whims of fashion, as gems and platinum became scarce. Designs incorporated fewer diamonds or precious stones, while making greater use of large, semi-precious stones such as aquamarine, amethyst and citrine. Broad expanses of polished gold in all its colors replaced platinum. 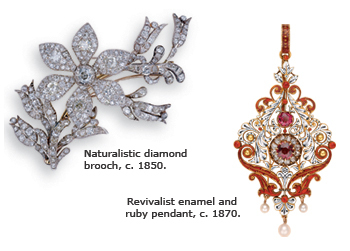 Diamonds were very rare, and jewellers encouraged breaking up old-fashioned pieces to reuse the diamonds. Designers revealed a new, refreshing approach to themes of flora and fauna, and created naturalistic fantasies. While the majority of pieces were bold and geometric, they were also curved and asymmetric, thus blending masculine and feminine styles.